Erin Thomas, Advisor, ICAAD: In March at the UN, there’s a buzz in the air. Thousands of women’s rights defenders gather in New York City to raise their voices about the injustices women and girls face all over the world at the Commission on the Status of Women (CSW). This year, the 62nd session was centered on rural women and girls. The two-week long conference was full of making connections and knowledge sharing. ICAAD kicked off the conference at an event run by Tonga, the Pacific Community, UNFAO, and Canada on tackling climate change through the empowerment of women and girls. Throughout the two weeks, highlights range from the small connections with fellow women human rights defenders to watching history being made. The UN Ambassador of Palau, H.E. Ms. Olai Uludong closing out the panel on tackling climate change through empowering rural women and girls. On Wednesday, ICAAD attended an event at SAP on Women’s Empowerment Principles in the private sector and engaged with other innovators on design thinking in social change. 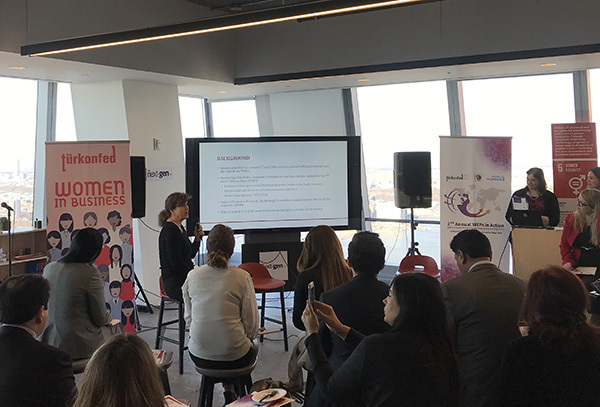 UN Women and SAP have partnered to create the #SheInnovates app which will connect women and girl innovators with mentors, training, and events to push the agenda on SDG 5 for gender equality. Women’s rights and tech has been a common thread through CSW 62 events. 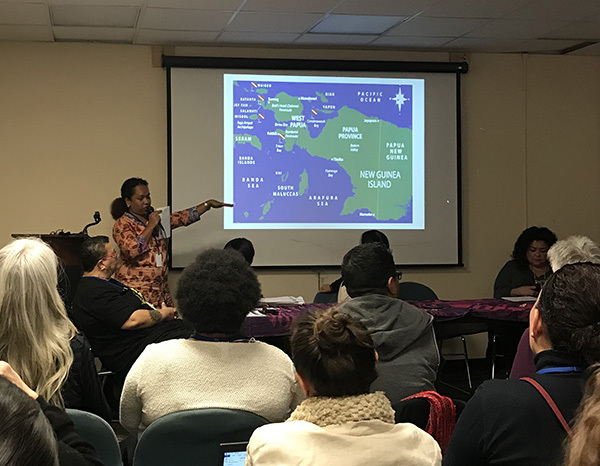 At an NGO-led panel, case studies on tech used to build agency, capacity, and advocacy efforts highlighted femLINK Pacific’s initiatives to involve women in the media. Erika Kvapilova from UN Women Georgia sharing their best practices to implement Women’s Empowerment Principles in Georgian businesses. The ICAAD team also witnessed history being made with the work of CEDAW general recommendation 37 which addresses how women are disproportionately affected by climate events. Many of these vulnerabilities are not inevitable, but are allowed by political and social institutions failing to engage in gender-responsive disaster planning and implementation. General recommendation 37 will function to hold governments accountable to not only include women and girls in disaster risk reduction but to ensure that outcomes address structural inequalities. Gender-responsive climate action was spearheaded by Fiji’s leadership at the last COP23, and other Pacific leaders have helped guide the international community in intersectional approaches to climate change response and risk reduction. Gender-based violence was often the focus of conversation. Advocates and leaders from around the world shared best research, prevention, and response practices. The World Health Organization hosted a panel on violence against girls which is an area ICAAD has been working on in the Pacific since 2013. Several of our programs have focused on gender-based violence (GBV) in the Pacific including: the report on gender bias in judicial sentencing patterns, the joint CEDAW report for Fiji, and the assessment of GBV in Niue. Indigenous activist at Dewan Adat Papua, Elvira Rumkabu, presenting on the genocide in West Papua and the role of indigenous women in demanding ecological and climate justice. CSW also provided ample opportunities for ICAAD to connect with other human rights defenders. Fellow change-makers from Australia presented on an innovative campaign where men in leaderships roles in the companies and organizations agree to be a Male Champion of Change which holds them accountable to improving gender equality in their organizations. They now have 130 male allies in leadership positions working to listen to, recruit, hire, and promote more women in Australia. 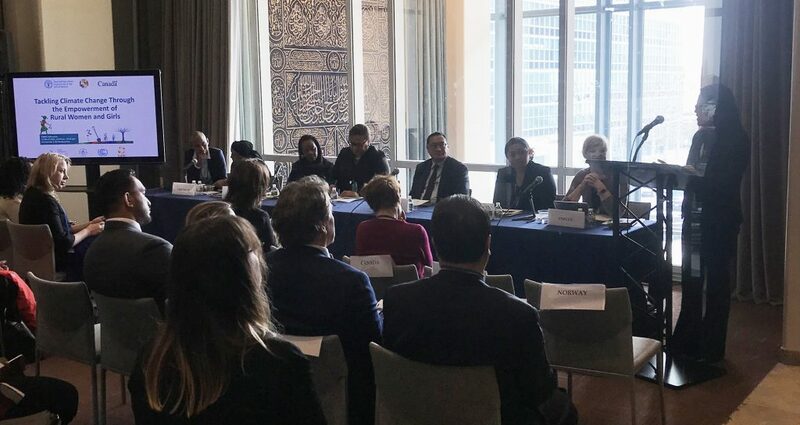 Many other organizations also emphasized the importance of partnering with and engaging the private sector in order to realize the goals of CSW 62. It was inspiring to hear other organizations and leaders in the international community sharing both struggles and best practices in our common fight to reduce structural discrimination for women and girls. In a statement that resonated deeply with the ICAAD team, Noelene Nabulivou of Diva for Equality in Fiji said that in learning and understanding the injustice in the world, it’s important to balance the fury and the love. It is through this balance that we break down barriers. Please see the final version of the Agreed Conclusions from CSW62.